Mountain View Charity’s board of directors include a wide variety of people from many facets of the community, all of whom share a common interest in giving back to Southeast Idaho. 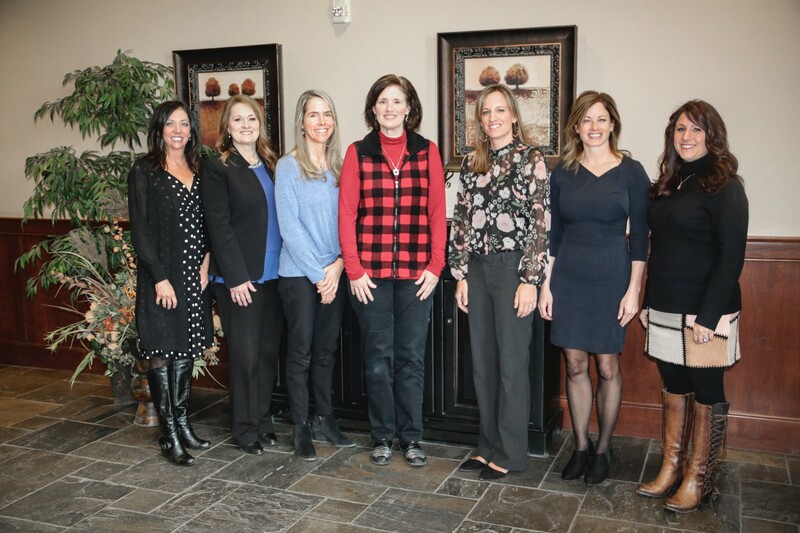 Mountain View Charity Board of Directors - From L to R: Kari Campos, RoLynne Hendricks, Kathy Andary, Mimi Taylor, Liza Leonard, Amy Brumfield and Nichole Hansen. Mimi Taylor is the President of Mountain View Charity and has served on the board since February 2013. She oversees the Medical Financial Assistance committee and enjoys the opportunity of helping individuals gain access to needed medical care. Mimi was born and raised in SE Idaho and loves serving her hometown and improving the health of the community. For over 20 years, Mimi has worked in public health in Idaho and Utah and is currently the Public Information Officer at Eastern Idaho Public Health where she also oversees the cancer prevention program. Throughout her career, Mimi has served the community with board positions at Eastern Idaho Community Action Partnership, the American Heart of Association of Utah, the American Cancer Society of Utah, and the Utah Hygiene Education Coalition. Mimi has a M.S. in Health Promotion from Brigham Young University in Provo, Utah. Nichole Hansen is the Administrative Assistant for Mountain View Hospital. Nichole is the Secretary for Mountain View Charity and has been involved with Mountain View Charity from the beginning. She enjoys being able to help people in the community through scholarship and medical financial assistance. Nichole is also involved in a non-profit program called Haloti Ngata Family Foundation, a program that provides ACT test preparation for High School students. Nichole is married and has 4 amazing boys and 4 wonderful grandchildren. Nichole enjoys spending time with her family, outdoors and traveling. Kathy Andary moved to Idaho Falls in 2002 where she transitioned from the professional world to full time stay at home mom. She has been fortunate to be involved with Mountain View Charity since it was founded in 2012. She is the current treasurer and she oversees the community sponsorship program. Kathy enjoys learning about and providing needed support to many valuable projects/programs offered in SE Idaho. Kathy has served the local community on various boards and committees including the Idaho Falls Medical Alliance, Snake River Montessori School and the Idaho Meth Project and is currently treasurer of her neighborhood HOA. She received her bachelor's degree from Michigan State University and her MBA from Wayne State University. RoLynne Hendricks has served on the Mountain View Charity Board since its inception. She believes in giving back to our community and state. In addition to her involvement on the MV Charity board, she takes an active role in several other organizations throughout the state of Idaho including board positions for Leadership Idaho Agriculture and Idaho Growers Shippers Association. She also serves as the Chief Growth and Strategy Officer for Cooper Norman CPAs & Business Advisors. RoLynne graduated with her B.S. in Business Administration from Utah State University and remains a devoted Aggie. She and her family reside in Twin Falls, Idaho. Amy Brumfield is the Mountain View Charity vice-president and chair of the scholarship committee, positions that she has held since Mountain View Charity's inception. With the board's help, she has developed and oversees the scholarship program which welcomes hundreds of applications from local college students each year. She greatly enjoys reading about so many talented and driven students who all seek to improve their lives and the larger world. Amy is an English instructor at Idaho State University where she is currently completing her PhD. Liza Leonard is the Marketing Manager for Ball Ventures, LLC. Liza joined the Mountain View Charity board to play a part in helping people in her community through medical financial and scholarship assistance. For MVC, Liza chairs the Marketing committee and is involved in public relations on behalf of the board. Liza has also enjoyed serving her community with board of director positions with the Idaho Falls Arts Council, the City Club of Idaho Falls, Idaho Falls Rotary Club and other non-profits. She has a BBA with an emphasis in Marketing from Idaho State University. Kari M. Campos is Senior Legal Counsel for Ball Ventures, LLC. Kari is passionate about service and volunteering in the community. As such, she could not pass up the opportunity to volunteer with Mountain View Charity, an organization so invested and successful in healing, building and strengthening individuals in our community that in turn makes our community better. As a member of the board, Kari helps review medical financial assistance application, assist the scholarship committee and the community sponsorship committee. Kari also serves as a board member on the Idaho Law Foundation, CASA Judicial District 7, Idaho Falls Business Assistance Corporation and the Idaho Falls Country Club. She has also served on the past boards of Big Brothers Big Sisters of Southeast Idaho and the Idaho State Bar Seventh District Bar Association. Kari received her Juris Doctorate from Brigham Young University and my B.S. in Accounting from Idaho State University. She is also licensed as a Certified Public Accountant.